Home / Brands / TAPESTRIES, THROWS, ETC. Popularity Newest products Lowest price Highest price Name ascending Name descending All brands TAPESTRIES, THROWS, ETC. 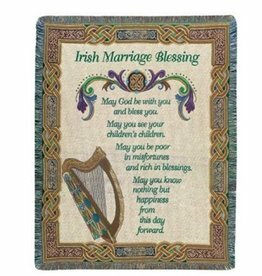 This Irish Marriage throw in woven in cotton knit earth tone and rich jewel coloring. Features celtic knot detailing throughout! 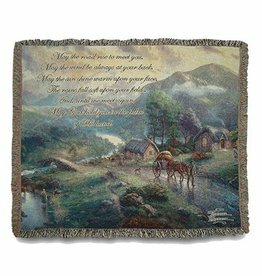 May the road rise up to meet you, the traditional Irish Blessing is woven into this cotton tapestry throw by artist Thomas Kinkade and titled Emerald Valley. 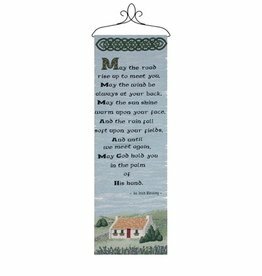 A beautiful tranquil scene with an uplifting sentiment of encouragement. 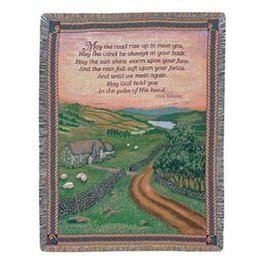 The gorgeous cottage scene is artfully woven with the iconic Irish Blessing. This eye-catching and charming wall panel includes a topper for easy hanging. Polyester and cotton. Tapestry 13x 36". Handcrafted in the USA. Let a good Irish friend know you consider them one of a kind! 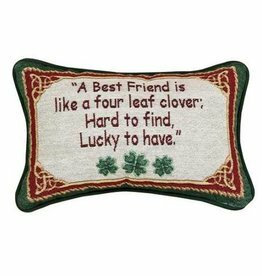 Our decorative pillow says "A best friend is like a four leaf clover; hard to find, lucky to have." 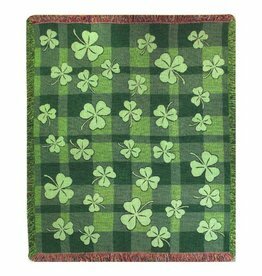 Makes a great Saint Patrick's Day gift.